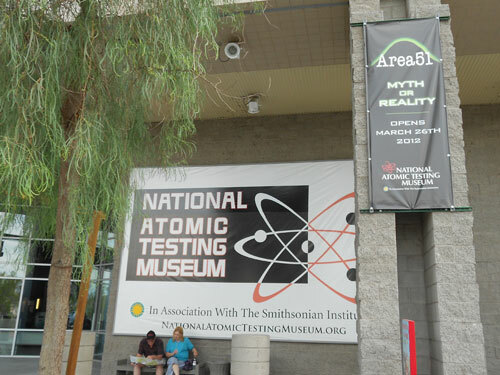 The National Atomic Testing Museum in Las Vegas, Nevada opened its Area 51: Myth or Reality exhibit in March of 2012. With this exhibit featuring UFO/extraterrestrial elements, the museum hosted special lectures in 2012 related to these topics, including one that featured former military personnel discussing UFOs. The museum has announced its first lectures of 2013, and just like last year, many of these presentations are UFO-related. On April 5, T.L. Keller is presenting a lecture titled “The Antelope Valley-Area 51 Connection.” Keller is an aerospace engineer and a former computer systems analyst for NASA’s Jet Propulsion Laboratory in Pasadena, California. In 2010, Keller authored the book The Total Novice’s Guide to UFOs, and was a presenter at the 2012 MUFON (Mutual UFO Network) Symposium in Kentucky. 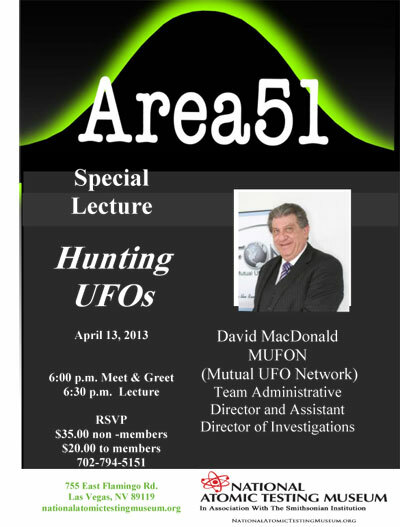 Dave MacDonald, the executive director of MUFON is presenting a lecture at the museum on April 13 titled “Hunting UFOs.” MacDonald’s presentation should serve as the perfect opportunity for him to promote the upcoming 2013 MUFON Symposium that will take place in Las Vegas this year on July 18-21. And on May 11, Dr. Lynne Kitei will present a lecture about the mysterious 1997 UFO event known as the Phoenix Lights. Other UFO related events are scheduled for later this year, but have yet to be publicly announced. If you are interested in upcoming events at the National Atomic Testing Museum, visit their website and sign up for the newsletter. In March of 2012, I attended a special media event for the grand opening of the museum’s Area 51 exhibit. The video below provides a brief introduction to the exhibit, and features the museum’s director and curator explaining why they decided to open the exhibit.